Cream and dark green fabric lampshade. 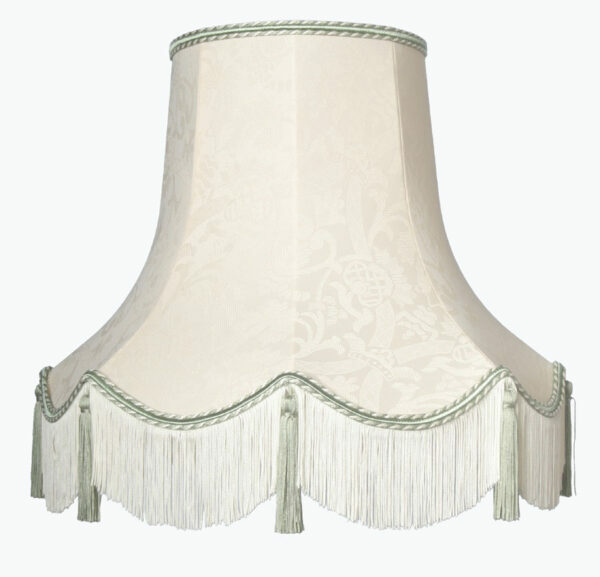 A quality handmade in the UK fabric lampshade suitable for floor standard lamps. The Knightsbridge made with a chintz cream fabric with a very soft floral theme. The top and scalloped edging is decorated with a dark green braid. The deep fringe finishes the traditional style with a contrast dark green tassel. Please see further image for braid colour options. The Knightsbridge is handmade to order and will take approximately 2 – 4 weeks. (The image illustrates cream and apple). Please can you tell me bottom diameter top diameter and overall height. Thank you. Hello Graeme, the bottom diameter is 560mm, the top the shade is 270mm and the overall height including the fringe and tassel is 500mm. Hello, I am interested in this shade with beige/cream braid. What type of standard lamp fitting does it rest on please. I am not familiar with your terminology but am worried that it won’t sit on my 80 + year old ‘cradle’. This delightful lampshade requires a shade carrier. This simply fits on the lampholder and supports the lampshade.